The Vinaya Pitaka, a rulebook for Buddhist monks, describes proper toilet use in detail. 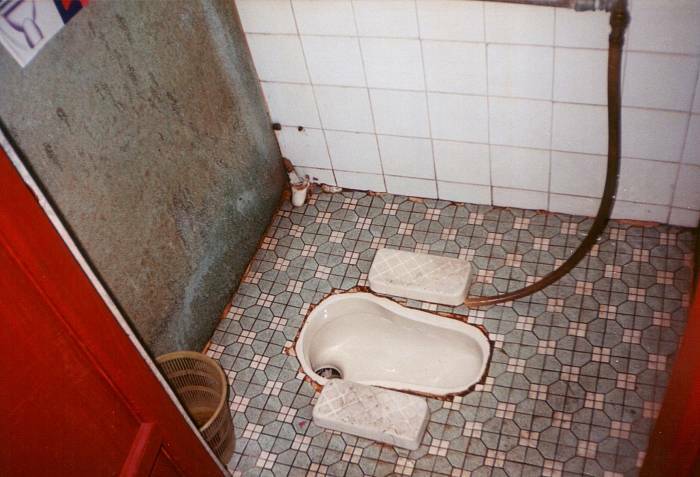 As just a small sampling, proper Buddhist monks should defecate in the toilet in the order of arrival rather than that of seniority; should cough loudly when arriving at the toilet (and anyone already there should cough in response); should not chew tooth-cleaning wood while defecating, should not grunt while defecating, and should not wipe themself with a rough stick. 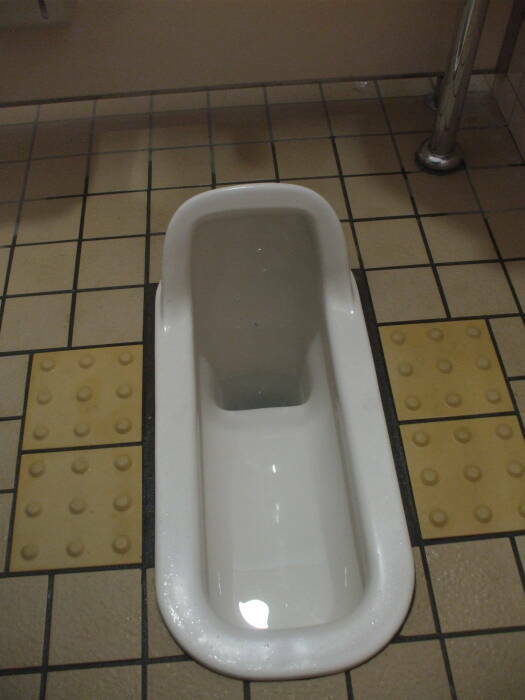 Other than the rules for the monks, these aren't "Buddhist toilets" as there's no such category. 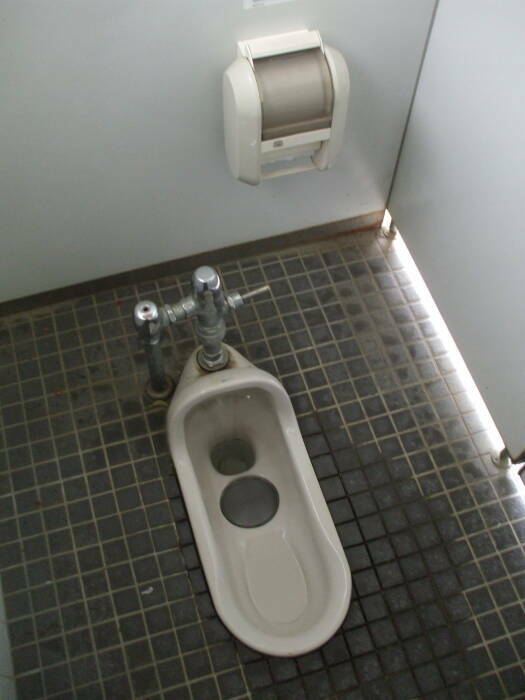 These are toilets built in the local style that happen to be at Buddhist sites. The Temple of the Six Banyan Trees is one of the few Buddhist temples left standing in Guangzhou, People's Republic of China, where any religion other than worship of Communist leaders is strictly regulated and mostly prohibited. 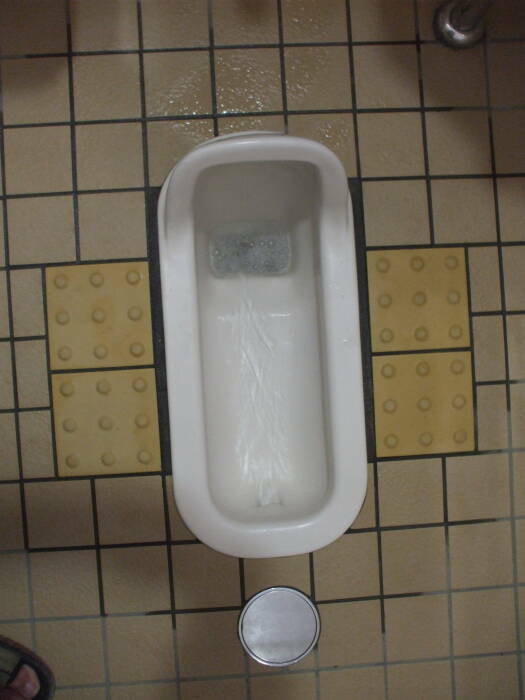 Notice the floor covered with small tiles, and the raised footpads. Those are specially designed ceramic blocks. Also notice the long hose for cleaning yourself. The floor in the stall drains into the toilet. Of course, with a hose running briskly not all of the water is going to drain into the toilet. There's a shallow channel along the row of stall doors that will catch most of the overflow. 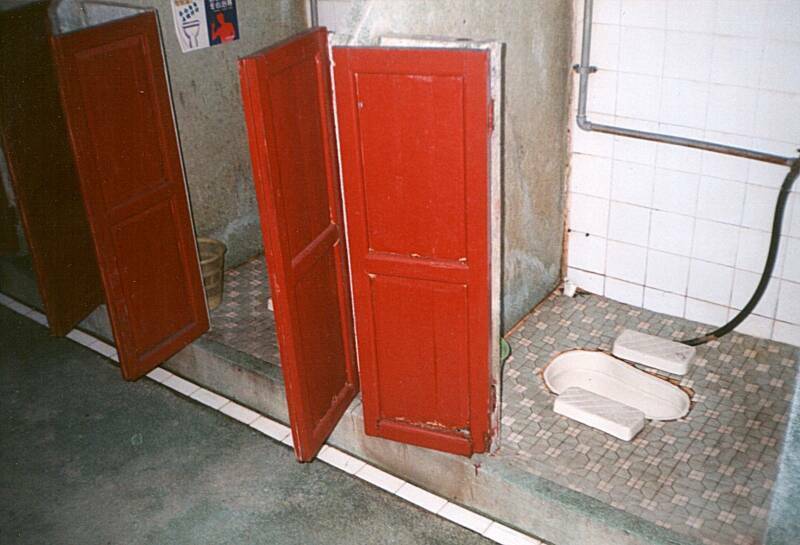 As collectivist Chinese toilets go, this one provides a much higher degree of privacy than usual. 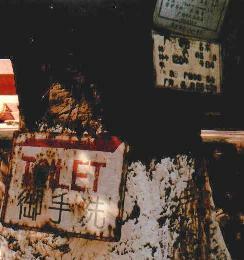 See the toilets at the Tomb of the Martyrs of the Guangzhou Commune W.C. for more typically communal Chinese toilets. This is their sign pointing the way. The way to the toilet, not the way to enlightenment. Now for some much more recent pictures, from Japan. Buddhism arrived in Japan in the 700s, by way of China. The multiple systems for writing in Japanese exist because of Buddhism. The original scriptures had been written in the languages of the Indian subcontinent and Tibet. They were translated into Chinese, at least partly, with many original terms left in place. When scholars from Japan went to China to study Buddhism, they first had to learn Chinese. The katakana script used to phonetically spell foreign words within Japanese text is based on a simplified set of Chinese glyphs, organized in Sanskrit order. Hiragana, a more cursive and complex Chinese-Sanskrit mashup, is used to phonetically spell Japanese words. Kanji, Chinese ideograms and much more complex yet, are used for many words in Japanese texts. More scholarly text will contain a higher percentage of kanji, requiring a larger kanji vocabulary. 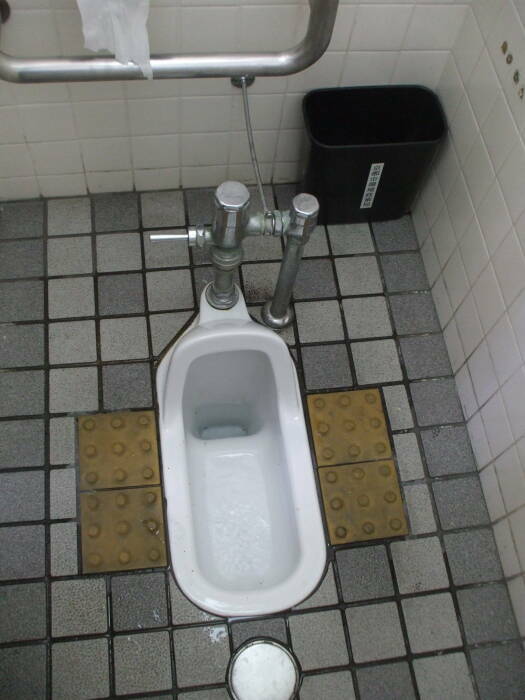 This toilet is near a small Buddhist temple within the Hachiman-gū complex at Kamakura. While predominately a Shintō complex of several significant shrines, it also houses some smaller Buddhist temples. That's the usual syncretic arrangement in Japan. 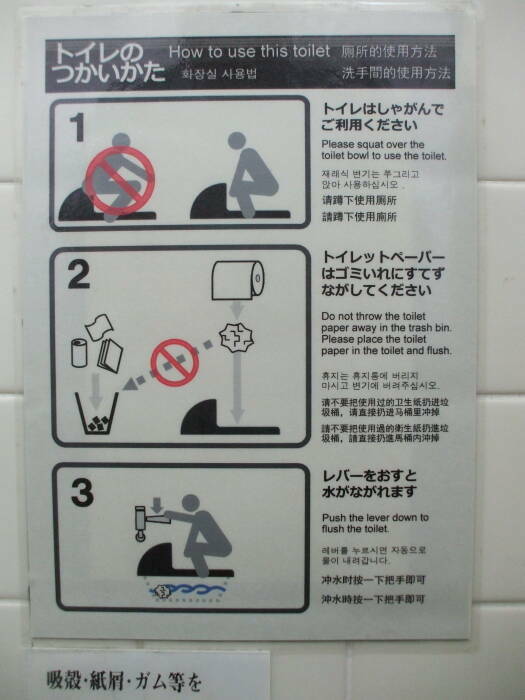 There are special sandals to wear in the washroom in Japan. A temple complex will provide them for visitors. These are at Engaku-ji, the #2 Zen Buddhist temple in Kamakura. It's the second rank of the "Five Great Mountains" Zen temples at Kamakura. 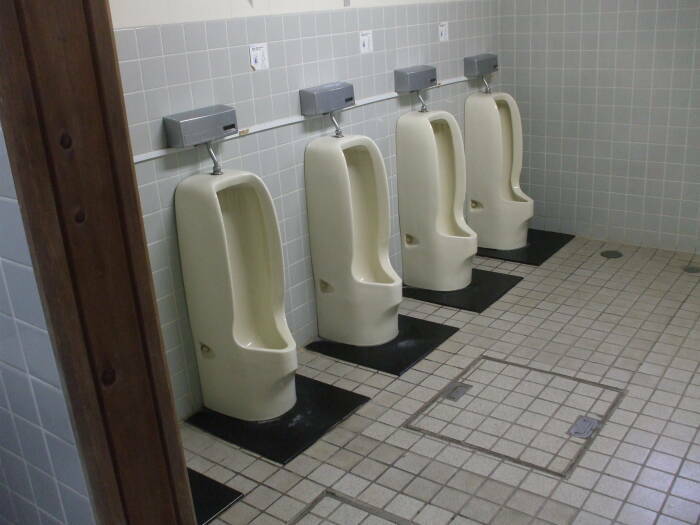 These urinals are at Kenchō-ji at Kamakura, the oldest Zen training monastery in Japan. It is the oldest and most important of the "Five Great Mountains" Buddhist temples at Kamakura. 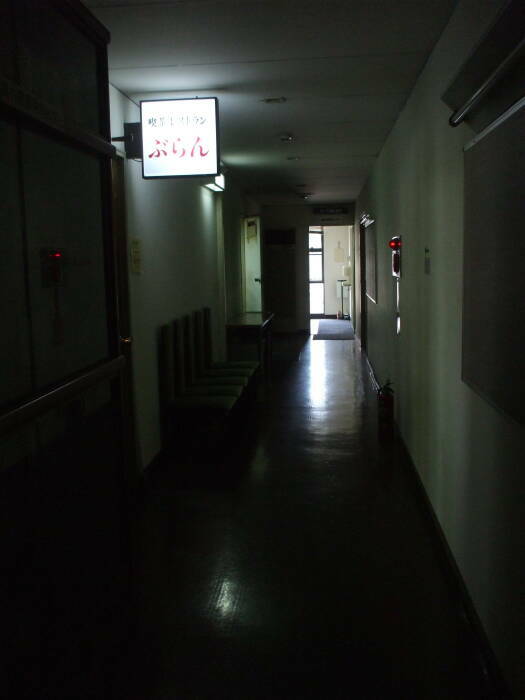 The public toilet at Kōshō-ji in Kyōto, the head of the Shinshu Kosho sect, is down a dark hallway in an administrative building beside the main temple hall. The temple was founded in the 1230s. Higashi Hongan-ji is the head temple of one of the two dominant sub-sects of Shin Buddhism in Japan. The single Shin sect had become very powerful. The shōgun Tokugawa Ieyasu split it into two sub-sects in 1602, Higashi Hongan-ji or Eastern Temple of the Original Vow, and Nishi Hongan-ji or Western Temple of the Original Vow. Being Buddhist, and thus compassionate, they provide helpful explanations in Japanese, English, Korean, and Chinese. 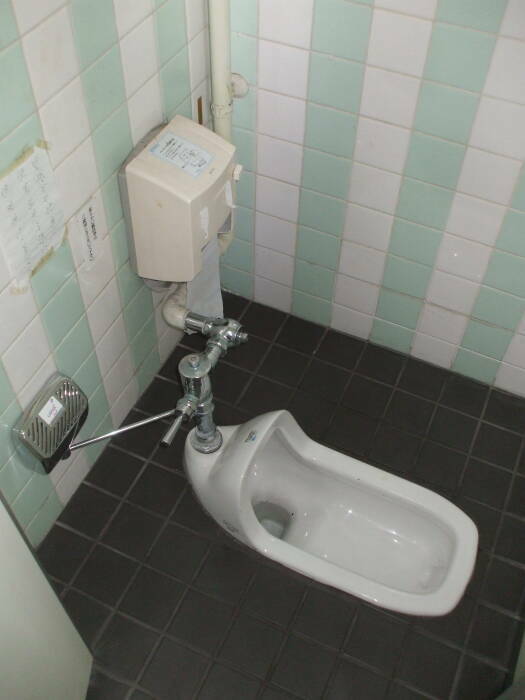 This toilet is at Ginkaku-ji, the "Temple of the Silver Pavilion", a Zen Buddhist temple in Kyōto. It's official name is Jishō-ji, the "Temple of Shining Mercy", but hardly anyone uses the official name. Above, it's flushing. 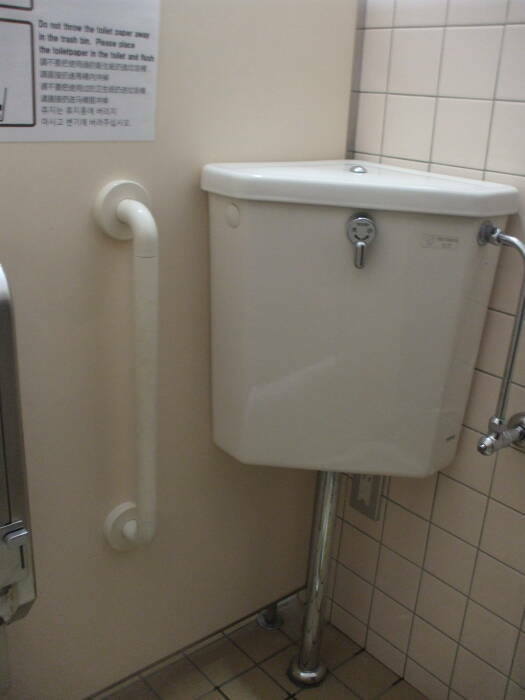 The flush tank is in the corner of the stall, next to the very handy handrail. 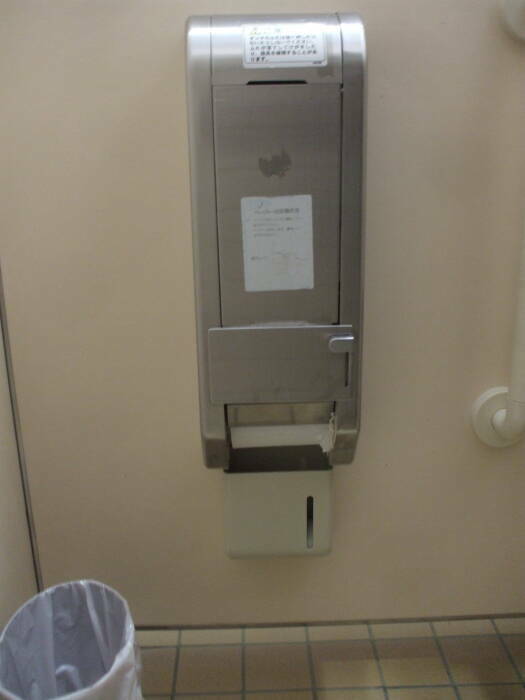 The toilet paper dispenser is on the other side of the handrail. Tōshōdai-ji, a temple of the Risshū sect of Buddhism, was founded in 759. Its complex is located outside Nara. The kyōzō and hōzō, the sutra storehouse and treasure storehouse, retain much of the original wood from their construction in the 8th century. That's unusual, as temples are frequently rebuilt. 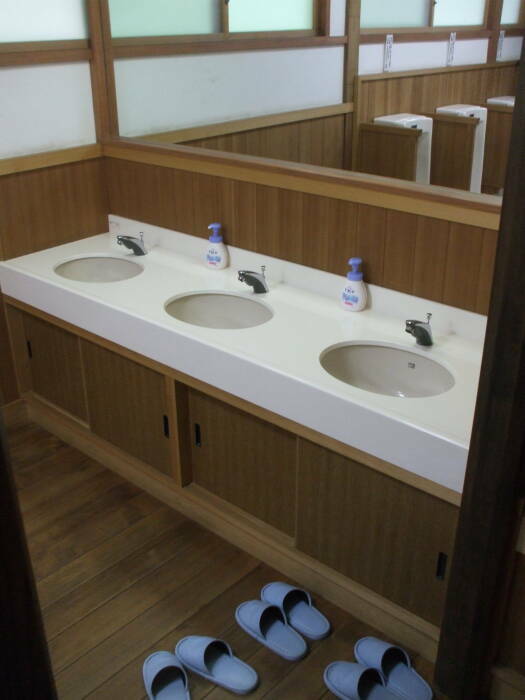 The public washroom, however, is of very recent construction.